Personalization, as exemplified by the popularity of music services like Pandora, has become a defining characteristic of a 21st century American musical sensibility; with an increasing number of Americans gaining access to on demand content, it would seem that the creation of a contemporary Great American Songbook is not only unlikely but quite possibly unwanted. And yet, despite the growing insularity of listening habits, it would seem that American popular culture continues to present individuals with auditory cultural touchstones in the form of viral singles. For better or for worse, creations like Rebecca Black’s “Friday” have become entities that we organize around, forming taste communities grounded in our reaction to the song. The importance of music in personal history and the construction of identity became oddly salient recently with the broadcast of HBO’s Phil Spector. It is, I think, all too easy to get caught up in ridiculing the appearance of Phil Spector. A notable recluse in his later years, Spector was thrust into the spotlight while on trial in 2003 for the murder of Lana Clarkson; somewhat given to eccentricity in both lifestyle and presentation, publicized images of Spector lent themselves to commentary that, more often than not, almost necessarily included mention of Spector’s hair. And although we might criticize the movie for overacting and underdeveloped characters, upon reflection what struck me as particularly poignant about the film was the way in which it reminded me that Phil Spector songs have had a memorable influence in my life. Using Spector as a jumping off point I began to think this week on the relationship between music, technology, and American social history; although it is tempting to look back and claim that landmark songs “changed” American culture, I instead want to pick up on the idea from this week’s readings that technology and culture (both in the form of music and more broadly) are mutually constitutive processes. 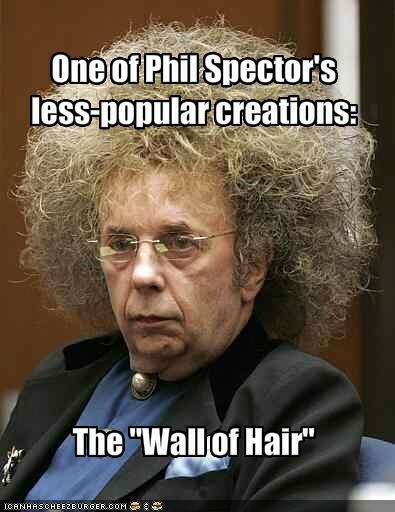 It is, for example, difficult to talk about the impact of Phil Spector’s songs without referencing The Wall of Sound. Born out of a (in retrospect) rather stubborn refusal to embrace stereo sound, Spector engineered a technique wherein sound from the musicians was piped down into echo chambers and then recorded, in effect creating a metaphorical “wall” of sound. More importantly, however, I wonder how Spector’s technique builds upon conventions that had long been established in African American gospel music and to what extent it was really “new.” Consistent with a larger move in rock music at the time, I marvel at how Phil Spector’s early songs helped to elevate ethnic minorities into the spotlight but also, at the same time, claimed their cultural practices for mainstream America. Consistent with Phil Spector, what I am most interested in is the way in which we use fiction to look back on a past that is both imagined and real. How do we make sense of things in retrospect and what does our thought process tell us about the way that we understand the present? Although my thoughts are not fully formed on the subject, I am curious about how pieces of our cultural past are strategically deployed to foreground certain parts of our cultural history while obscuring others. 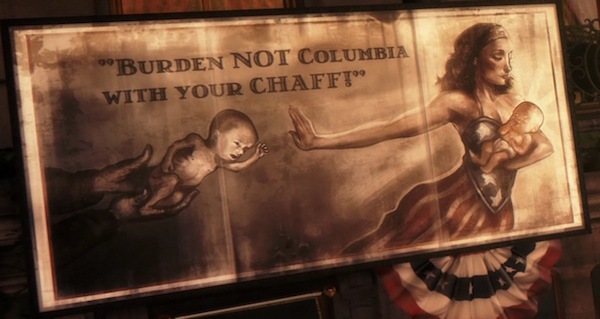 Bioshock Infinite is a video game premised on a many worlds theory, presenting an alternate history of America in the form of the utopic/dystopic floating city of Columbia. Reflecting sentiments from early 20th century America, the city evidences strong tones of nationalism, theocracy, and jingoism. And, given our continuing struggle with race (see “Accidental Racist”), I wonder about how something like Bioshock Infinite speaks to the way in which we see ourselves in relationship to our own history. To be sure, the game plays fast and lose with history as it incorporates musical easter eggs throughout the world. “God Only Knows,” a song influenced by Spector’s Wall of Sound technique, makes an appearance early on in the form of a barbershop quartet. Although rather charming, there is a way in which this type of action reflects a modern sensibility that songs (or perhaps moments in history in general) can be divorced from their surrounding context and transplanted as discrete units. Given the game’s logic I am fully willing to concede that a composer could have peered through dimensions and lifted this song but it seems unlikely that he would know why such a song was popular in the first place. This move seems to be much more about the developers trying to establish a relationship with players than creating a world (which is fine), but the way in which they have gone about it makes me worry that our understanding of cultural artifacts ignores the way in which they are part of systems. This is, to be sure, an intentional on the part of writer/director David Mamet who even has Phil Spector suggest at one point that his song was playing the first time that his lawyer was felt up. The obvious answer is that if early Science Fiction was about exploring outer space, the writings of the late 20th century were largely about exploring inner space. More than just adventure tales filled with sensation or exploration (or cyberpunk thrill) the offerings that I encountered also spoke to, in a way, the colonizing of emotion. Thinking about Science Fiction in the late 20th century and early 21st century, I wondered how some works spoke to our desire for a new form of exploration. We seek to reclaim a sense of that which is lost, for we are explorers, yes—a new form of adventurer who seeks out the raw feeling that has been largely absent from our lives. Jaded, we long to be moved; jaded, we have set the bar so high for emotion that the spectacular has become nothing more than a nighttime attraction at Disneyworld. At our most cynical, it would be easy to blame Disney for forcing us to experience wonder in scripted terms with false emotion constructed through tricks of architectural scale and smells only achievable through chemical slight of hand. But “force” seems like the wrong word, for doesn’t a part of us—perhaps a part that we didn’t even know that we had—want all of this? We crave a Main Street that most of us have never (and will never) know because it, in some fashion, speaks to the deeply ingrained notion of what it means to be an American who has lived in the 20th and 21st centuries. For me, there are glaring overlaps with this practice and emotional branding, but what keeps me up at night is looking at how this process may have infiltrated education through gamification. Were students just getting sucked into a culture that put a premium on achievement and not really stopping to think about what they were doing or why? We can talk about the positive aspects of gamification, levling and badges, but as the years wore on, I really began to see titles on activity summaries as things that were fetishized, obsessed over, and coveted. Students had learned the wrong lesson—not to suggest in the slightest that they are primarily or solely responsible for this movement—going from a race to accumulate experience to merely aggregating the appearance of having done so. How could I convince them that, as an admission officer, it was never really about the experience in the first place but instead how a particular activity provided an opportunity for growth. It was—and is—about the process and not the product. But, that being said, I try not to fault students for the very actions that frustrated me as a reader are reinforced daily in all aspects of education (and life in general). Processes are messy, vague, and fluid while products are not. How would one even go about conceiving a badge for emotional maturity? Would one even want to try? Perhaps I am clinging to notions of experience that will become outdated in the future. Science Fiction challenges us to consider worlds where experiences and memory can be saved, uploaded, and imprinted and, really, what are recreational drugs other than our clumsy attempt to achieve altered experiences through physiological change? I don’t know what the future will bring, but I do know that my former colleagues in admission are likely not thinking about the coming changes and will struggle to recalibrate their metrics as we move forward. A profile piece in PC Gamer sparked a class discussion on the ethics of ramifications of virtual murder in EVE Online, causing me to wonder further about issues of ownership in MMORPGs. Given the situation described in the assigned reading, one might very well make the argument that much fuss was raised over Negroponte’s bits, essentially a meaningless commodity in and of itself. By all accounts, however, the sense of loss felt by victims of online theft seems very real. In order to better explain this phenomenon, I would suggest that what is lost is not just the item, but the representation of that item; badges, achievements, and trophies have become a method for us to gauge ourselves against one another and provide a palatable way for us to measure up. Status and identity have coalesced into (worthless if meaningful?) bytes, and the stealing of these items represents a loss in our sense of self. Can we ever go back to valuing what the badges are supposed to represent? Can we ever go back to an appreciation for having had an experience? In a broader sense, the question of possession becomes increasingly relevant as we also seem to be moving toward a culture in which the lines of ownership have suddenly become much blurrier. We freely (if perhaps unknowingly) release personal data online, engage in a continual process of remix through sites like YouTube, and have begun to realize the power of crowdsourcing. Facebook owns the data that we upload and yet we bristle when the company chooses to use that information in a way that violates our assumptions regarding fair use. 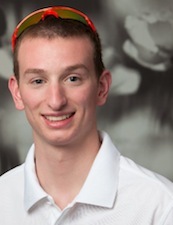 Where and why do we draw the line regarding ownership? Going back to EVE Online as an example of an MMORPG, why is that we feel that anything in the game is ours in the first place? Put another way, all of the loot/drops/rares are the property of the game company—although we may have them temporarily in our inventories, we do not necessarily “own” them. Do we unavoidably apply the principles gleaned from real life (e.g., physically possessing an object means that we, in some way, own it) to the online realm? As we increasingly integrate virtual worlds into our lives, will we develop new rules and/or standards regarding the ownership of information as opposed to property? Is information in fact property and, if so, to what extent? Issues of ethnicity, another important (and perhaps arguably fundamental) aspect of identity, do not solely manifest in online spaces and although their virtual presentation confers a set of challenges that remain unique to that environment, lessons from real life racial politics can still apply. Before proceeding, it should be noted that I draw distinctions between the terms “ethnicity” and “race,” although they are often used interchangeably in literature and vernacular. A result of my background in Biology, I conceptualize race in terms of biologically derived aspects like skin color while I define ethnicity as comprising of cultural elements that include locale, religious practices, and/or traditions (i.e., the physical layer versus the social layer). Given this schema and their dependence on the presentation of physical traits, online issues of racial identity, then, might be different in MUDs/MOOs and MMORPGs, as the latter potentially possesses fewer graphical constraints. Defining oneself as “African American,” for example, has different consequences in the various constructs considering the available resources available to players to create such an identity—given a lack of appropriate visual cues, using “African American” in a MOO might be interpreted as racial or ethnic identity (or, more likely, as a confluence of both), presenting an ambiguity that a visualized avatar does not. Yet, regardless of our individual definitions of “race” and “ethnicity,” we can examine some of the various real world strategies employed to mediate racial differences in order to obtain overarching lessons and warnings. Looking at metaphors for ethnic diversity in the real world, we often hear the term “colorblind,” indicating that a subject (e.g., a person, a group, or an institution) professes not to see the differences presented by various racial groups. Although a good-hearted gesture, “colorblind” and the related concept of “melting pot” ultimately serve to essentially erase the notion of race by subsuming all individuals into the dominant racial or ethnic group; we no longer see color because we are all the same color. A much more difficult model has been introduced and labeled as the “fruit salad,” which attempts to encapsulate the idea that each ethnicity brings something different to the mix and that the final product should celebrate these differences. Translating this to the online sphere, it seems only prudent to encourage individuals to understand their virtual ecology, respecting the various niches and roles that other users might fulfill or perform. Although originally employed in the context of national identity, Benedict Anderson’s concept of “imagined communities” might present additional means to understand the community structure outlined in J. C. Herz’ Joystick Nation. Through descriptions of shared spaces that range from the arcade to online environments, Herz advances the idea that the communal aspects of gaming find themselves inextricably linked with economic systems and subcultures. Importantly, however, for gamers the community represents more than just a pool of potential opponents: gamers relish the ability to exchange ideas and information. These individuals, then, do not merely comprise a public in terms of the physical but, through their shared sense of identity and values, give rise to an imagined community. Anderson’s position also incorporates Jose Ortega y Gasset’s thoughts on minorities as collectives of self-selecting individuals who congregate around a shared distinction between upper and lower (i.e., elite and mass) classes. Although it is unlikely that many minorities or subcultures view themselves as nation states, Anderson’s concept reinforces the important notion that communities are finite; while nations might have boarders that manifest physically (at least on maps), imagined communities distinguish themselves based on networks of shared ideas and potentially transcend differences in class, ethnicity, gender, and location. In a world that increasingly finds itself connecting through online media, the concept of an imagined community holds greater resonance than ever. Although we cannot discount the powerful nature of in-person interactions and physical communities in examinations of culture or movements, one might also make a case that individuals will continue to affiliate with others in the formation of virtual “states” despite being potentially being geographically dislocated. The present day sees individuals juggling the once clearly defined dichotomies of local/global, private/public, and online/offline, as they renegotiate self-identity and their place in the world. Arguably idealistic, the Hacker Ethic posits a few lofty goals, including the notion that art and beauty can be created on a computer. Possibly incorporating elements of the philosophy found in cultural theorists like Theodor Adorno, one can understand the efforts of early game designers as an attempt to produce art for art’s sake. Looking at modern society, Adorno (a notable member of the Frankfurt School) might very well castigate video games as part of the culture industry—with some exceptions, video games have become manifestations of creativity or art that are more valued for their ability to make money than for their aesthetics. Although I tend to view Adorno’s position as unnecessarily elitist, I also recognize that his views developed in a period that held strikingly different views on art and culture. This is, of course, not to imply that Adorno’s critiques cannot be applied to the current state of affairs, merely that society has possibly changed in ways that cannot be accounted for solely by Adorno. In particular, if we are to accept that the presence of Atari in the late 1970s planted the seeds for a radical shift in thinking among consumers, we can see an immediate point of contention with Adorno, who viewed audiences as passive and deriving pleasure purely through consumption. Contrasting with this view, modern cultural theorists often understand today’s audiences as being potentially active and participatory—media have become interactive and academics race to understand the ways in which channels like television, video games, and the Internet affect cognition, learning, and community. Moreover, I would argue that the interactivity suggested by video games has altered the way that people react/respond to art. Increasingly art is not merely something that makes you feel or think but something that you experience and do; we are learning to experience alternate forms of art (often multi-sensory!) while simultaneously gaining a new perspective conferred through our increased role in modes of production. Adorno’s thoughts also overlap with Marxist views on the power of ideology to distract workers from noticing the ways in which the state oppressed them, but this is a larger discussion that I do not have space to expand upon. In a recent TEDx Boston talk, Seth Priebatsch spoke briefly about the ways in which game mechanics are currently being employed in a variety of areas, offering incentive/loyalty programs as a relatively palatable example. Arguing that a developing “game layer” existed (separate from the “social layer”), Priebatsch sought to convince his audience that understanding game mechanics was key, for these were the rules that governed influence and behavior. Getting away from possible connotations with games as childlike or superfluous, we might also consider how real world game mechanics are really no different than the structure provided by religion—both constitute frameworks that order our choices based on our expectations for future outcomes. As someone who works in Higher Education, I immediately began to consider the ways in which games and education have been paired in the past. Although we certainly have had some success using games to teach children skills through scaffolding, the merging of the areas has often resulted in concepts like Edutainment or serious gaming, which seem to represent an attempt to harness gaming into something pro-social or productive. Reversing the direction of influence, Jesse Schell spoke at DICE 2010 about how the logic of games can be applied to educational settings, transforming the way that we think about grades to resemble the process of leveling up. Although this approach made much sense to me, as it spoke in a language students seemed primed to understand, I also began to wonder about the quantification of achievement. 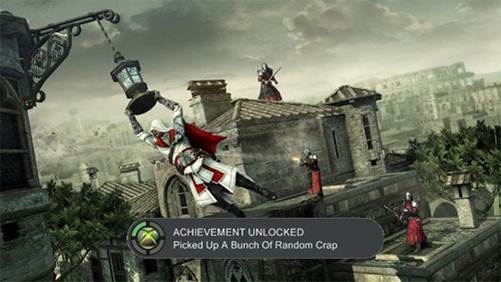 Are we turning into society largely motivated by trophies or unlockables? Is this really different from previous cultures or have we simply found a new way to express our desire to gain a sense of identity through external labels that we manufacture and then bestow upon ourselves? Does our sense of self become dependent on “real life achievements”? We buy into a system that designates some accolades as worthy of a title or a badge, but who gets to make these decisions?